Although I don't think that OG squad had one of the top 3 goalies in the league. Richie, Kase. on and on that the team will be better. Steve are you writing for the Ducks again? The injuries clearly have hurt the team, and while I don't think it will be that bad, there is still going to be problems going forward. The team will live or die with Gibson really. Have a feeling though RC is going to be gone soon, and that change alone could spark the team. Now we can look forward to a blog every 3 months or so. We got our coach fired and we didn’t get a blog! I got a good feeling about tonight boys!!!! ADVISEMENT: Kings are not getting blogs wo we will be taking over here. "Steve Palumbo: History repeating itself in Anaheim"
I was all excited when I read the title. I remembered when Bruce Boudreau was fired. Two days later Carlyle was fired and Boudreau hired. I assumed the article was about Coach Q getting fired and the real possibility Carlyle would be fired again and Q hired. Then I read the article. What a total letdown. Shut up, Quack! You and your fellow pond poopters better find yourselves a new home! This is Kings country now! Just as staples will be Duck land tonight as we invade and conquer. You still here? Pond poopters begone! Go to the shafts blog. This is KINGS COUNTRY!!!! Does quenville wanna coach this year? Sure he'll have a ten to 15 choices in the off season. Maybe 6 or 7 now. Oh please. Your team is a major cluster F.
If Ucks win tonight: you can have the blog back. If Kings win: All the Quacks must leave and find refuge in another blog. That may be so but the ducks jerseys look worse than my kids roller hockey jerseys... my wife thought we were playing the sharks, or ripping off our og jerseys with the purple. lol I see 3 orange jerseys... only 1 team invades the others barn, and duck fans don't leave my home county of orange. He has 2 years left on his contract (this year and next), at 6M per year. 10M sounds about right. I thought we were supposed to rattle off 20 wins in a row after Stevens was fired? The coach can only do so much. Firing Steven's might have been a wake up call for the kings. 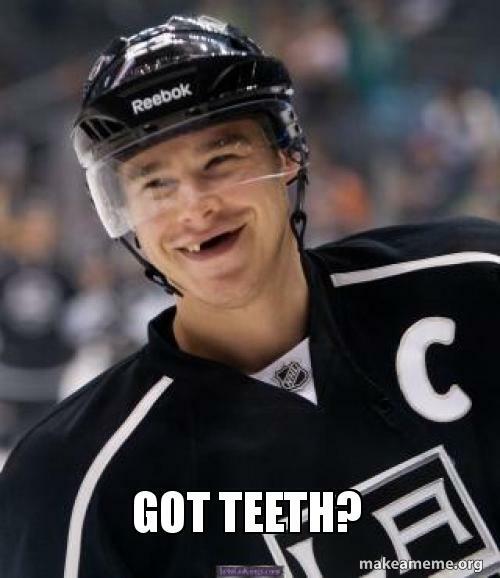 At least I think that's what Rob Blake was hoping. In the end I think your going to have to a least retool with some younger players like the ducks are tring doing. It still takes a while though. Tring to prop up a team with free agent signings only works when there is no salary cap. Speaking of the ducks. Just watched them get beat by the wild. The wild were quick and focused. They looked like a playoff team. But they did what they should have done. Beat a struggling team that's retooling. The team still has a long way to go but they are better than 2 weeks ago. Still long term fixes are needed. If things keep going the way they are then things are gonna need to change in Anaheim too. More than just the coach. But usually that's where they start. Our top line isn't what it use to be. But Getzlaf is really starting to get in sink. And that's what you'd expect from the captain. But the rest still look really unsure of themselves. Still Bobs gotta make a change eventually. And the coach is the most obvious place. But I think in this case it will lead to little change. Whoever replaces randy is going to inherit a mess. And it's a mess that only time and practice can fix. Let's not kid ourselves ducks fans. There is no quick fixes. Only hard work and patience is going to fix the problems this team is having now. KINGS LOST ! KINGS SHUT OUT ! KINGS LOST !!!!!!!!!!!! !QUEENS SHUT OUT !! !